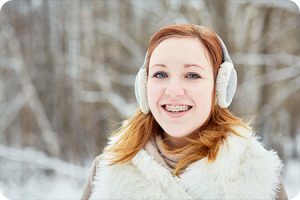 Webster Groves MO Orthodontist Answers: How Long Does It Take to Get Braces? “The faster you get braces on, the faster you get them off” is a statement you may have heard in your journey to a straighter smile. Our Webster Groves MO orthodontist works to keep the process of getting your braces on as streamlined as possible. While the process may involve a few consultations that vary in length depending on your needs and specific smile, once braces have been recommend for you, having them applied is a fairly straightforward process. During your first appointment, your Webster Groves orthodontist will examine the particular measurements, needs, and conditions of your smile. Based on this data, your orthodontist will be able to recommend which style of braces is best for you. Should traditional braces be the preferred route, scheduling an appointment to have the brackets applied will likely be the next step. The day you have your braces applied, the appointment should last roughly 60-90 minutes. The teeth will need to have a thorough cleaning so that the brackets can be glued to as clean a surface as possible. After the cleaning, the brackets will be applied. Sometimes the adhesive may taste unpleasant, but the substance is not harmful. Your Webster Groves MO orthodontist will also walk you through the most effective care and cleaning procedures so that you are well prepared to take care of your braces in the following months. Our Webster Groves MO Orthodontist Answers: How Long Does It Take to Get Invisalign? If you are a better candidate for Invisalign than traditional braces, your Webster Groves MO orthodontic office will measure your smile for well-fitting impressions to be designed. These meticulous measurements are then sent outside of the office to be made. It typically takes 3-5 weeks for the trays to be sent back to the office, and upon arrival, your office will schedule a time for you to come pick them up. After receiving either traditional braces or Invisalign, you will schedule periodic appointments with your Webster Groves MO office to have tweaks applied and progress tracked. Throughout the process, should you have any questions, be sure to call your orthodontist in Webster Groves. This can help to make the rest of the process as smooth as the application itself. The information provided in this article is not meant to be medical advice and is for educational purposes only. If you would like to learn more about this and other topics related to orthodontics, feel free to contact Borello Orthodontics, with a convenient orthodontic office location near Webster Groves MO, by clicking here or by calling 314.821.2400.